Boats & More stock a wide range of boating accessories to make your day out on the water safe and comfortable. Need a new fish finder, anchor or life jacket come in and see us at our store. We have the experience and knowledge to make sure you have the right accessories for the right job. Since its beginnings in 1974 BLA, Boating’s Leading Accessories, has become synonymous with service, quality and a genuine passion for boating and leisure products. 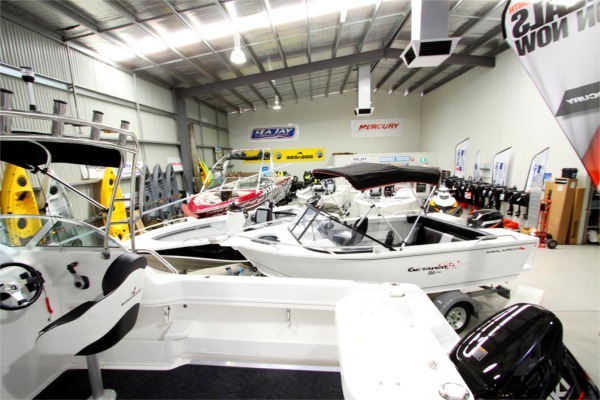 With over 32 years experience of providing quality marine equipment BLA has become a market leader within the marine industry throughout Australasia. The Worlds First Rated Sun Smart Inflatable Rashie/Swim Shirt brand name EVIE (Emergency Vest Inflatable Equipment) has been developed for safety & comfort and will assist with all water enthusiasts providing buoyancy and sun protection. Available in long & short sleeve with Oral, Manual or Automatic Inflation this revolutionary hybrid Life Jacket/Swim Shirt is a must for Boaties & Fishing enthusiasts. PFD Australia’s patented front opening system is unique. When deployed, the jacket sits on your chest with the bright 150 Newtons of buoyancy Australian made bladder fully exposed, keeping your head floating above the water in a correct position. The front opening systems allows for the PFD to be made in dark and multi colours, and with the buckle fastened our Storm Rider series are the only Personal Flotation Device that can legally be worn unzipped and open.